The term ‘medical geography” became a part of the American literature in 1799. The definition of the term medical geography was developing over several years by this time, some historians might even state it took several decades for this term to become a part of the medical philosophy in North America. Historians who are purists would probably claim that the idea of medical geography extends back as far as the period of Ancient Greek literature, being contemplated, philosophically argued, and practiced by a number of very early scholars. This reference to the term medical geography however refers to the actual words, bot just the idea. During the 1760s and 1770s, a French Army is noted as having included specific details on the their military maps about the least healthy places to set up camps. These maps are often referred to as some of the first medical geography mapsof disease, although a review of colonial maps can at times reveal maps which focus on the “Vly” or swamps of given areas. The inference is that this are is unhealthy and perhaps even in need of filling, otherwise it may be considered a potential topographic cause for recurring fever endemics in the new hamlet being established. James Tilton’s work with the military exposed him to this important piece of American medical history. He most likely learned about the cold winters experienced by both armies during the early years of the Revolution, and learned much from the ship surgeon’s diaries and books. 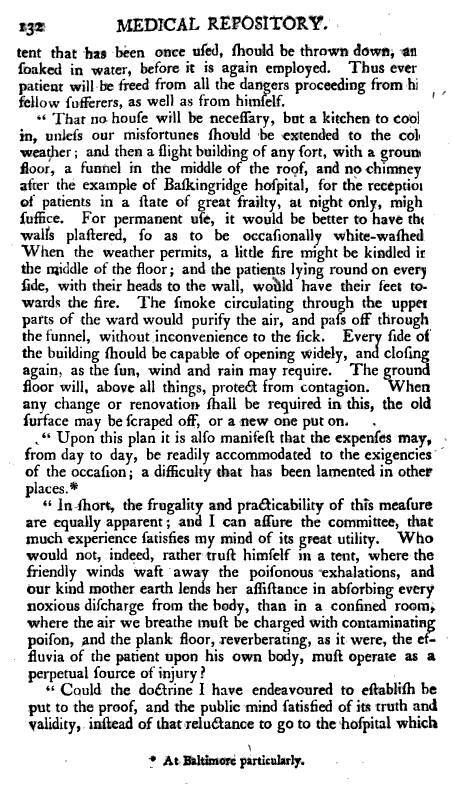 Disease in the prison or gaol, the hospital, the military encampments, were all important medical related issues that Tilton was already familiar with. Tilton was familiar with the past inoculation controversy of the Revolution (it took the army about 6 to 8 months to acccept and believe in the values of inoculation). He was strongly engaged in trying to promote the method of vaccination developed for small pox, relying upon kine pox inoculations. For Tilton, the value of vaccination was obvious, and the difference between infectious diseases like measles and small pox well understood by Tilton. But Tilton was also well trained and experienced in the studies of medical topography and medical climatology that officially existed during this time. He was familiar with the philosophy for “camp fever” and dysentery that often erupted at military encampments, and like most others he blamed these diseases on miasma. This miasma he thought to be naturally produced by decaying organic materials found in the swamps and along lake edges. The camp fever may also be generated by the filth of a crowded living space. Like nearly everyone else, he knew something about animacules and disease, but nothing about the possibility of mosquito-born fevers like ague (malaria) and yellow fever. These he also felt were results of miasma. But Tilton was also an example of a early contagionist concerned with sanitation as well as exposure to the environment as being related to disease onset. He was familiar with the issues of poor camp hygiene, poor latrine recycling and toiletry habits, poor dietary behaviors. He knew that another potential cause for disease could be the decaying garbage left at sites just outside of the typical encampment setting. He also knew that animal slaughters for food supplies were not always engaged in using healthy practices, and proper disposal habits for the remains of the carcasses. Once he became active in the military, he would have been made familiar with the problems the American patriots had to face in Valley Forge, and the needs for adequate inoculation programs in these settings. Based on other writings Tilton produced, we know he was very much in support of engaging in the kin pox vaccination program once this became common knowledge (about 3 years later from this article’s year of publication). One other series of medical geography writings to make note of are the German writings by Leonard Finke, in which the term infeering Medical Geography–“Medicinsche-Praktischen Geographie“–was used for the first time in any regular and meaningful way throughout an entire book. This book however reviewed just the northern temperate zone of the earth, and lacked adequate maps. Its author probably assumed that readers were already familiar with the unhealthiness of the torrid zone being taught at most institutions. Just how much the United States was familiar with these writings is uncertain. But more than likely, these writings explain how and why the term ‘medical geography’ came to be, first in Europe, followed by the United States. It is also possible that one or more of the local German trained physicians already residing in New York (the “Rhinelanders” residing in and near Livingston’s Columbia County), or those who migrated to New York and tried to obtain licensure from the State Committee defined by Govr Clinton (Committee formed in ca. 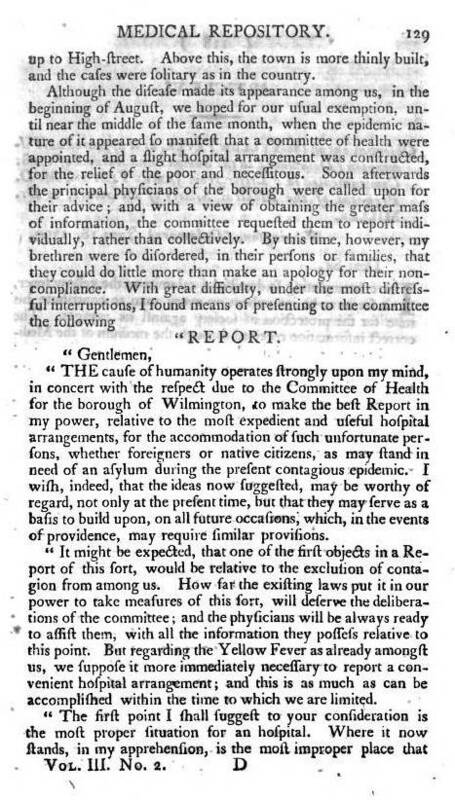 1795, with notes seenon this in NY Medical Society meeting notes and in local biographical research notes by Dutchess County physician and medical historian Guy Carleton Bayley; both authors’ findings suggest this to be the case). 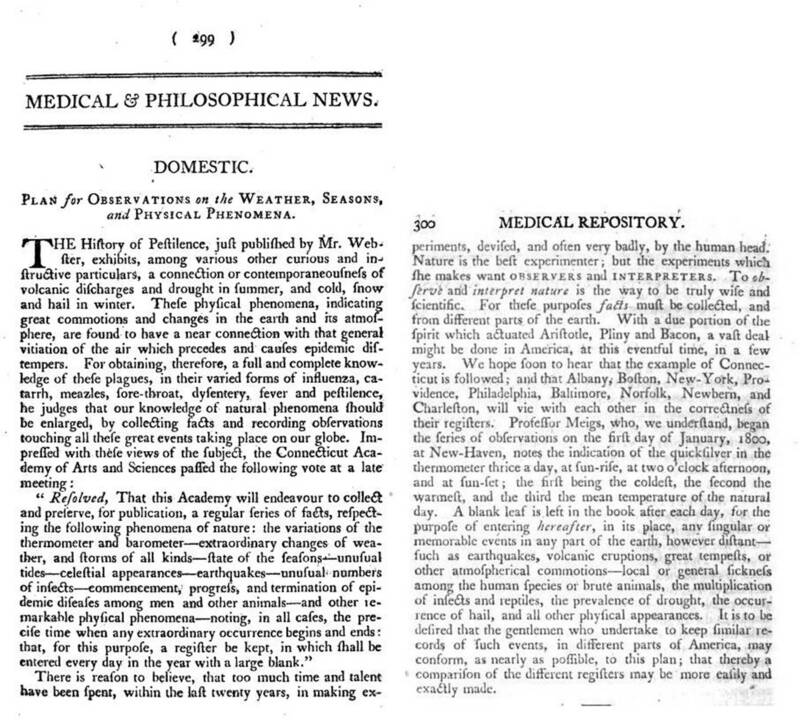 America’s first use of the term “Medical Geography” in the professional writings was probably by Samuel Mitchell of New York. 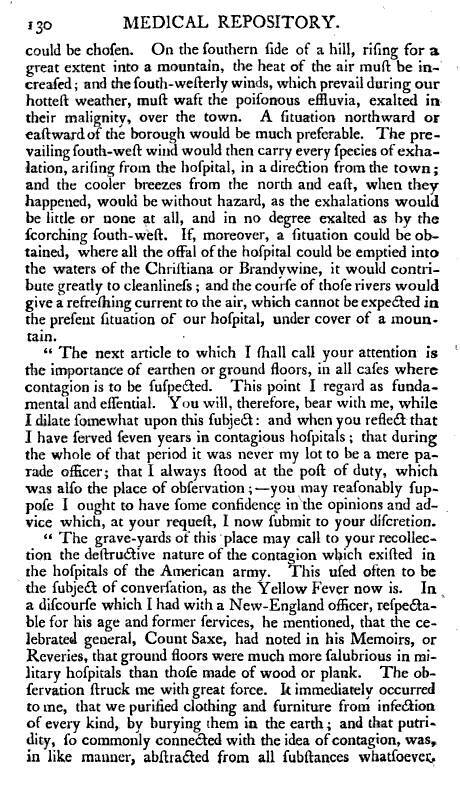 It was Mitchell who penned the article entitled An Outline on Medical Geography (1799), which was his review of the recurring yellow fever epidemics then rampant in American medical history. 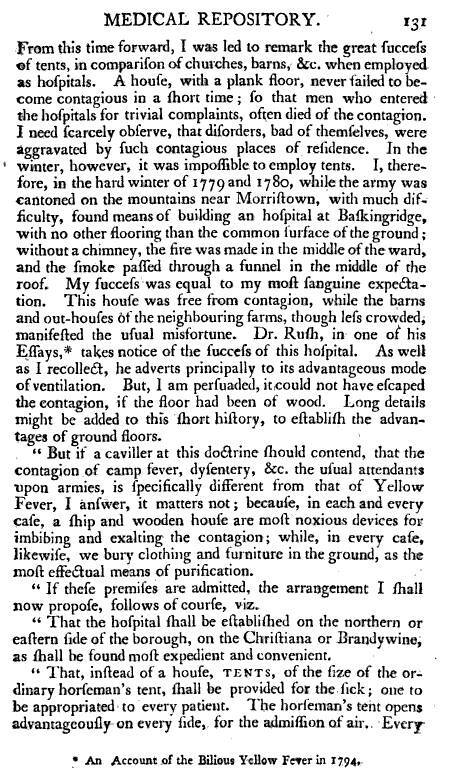 Yellow Fever might not had resulted in a writer like Mitchell defining this term, were it not for the way in yellow fever behaved globally as well as locally. 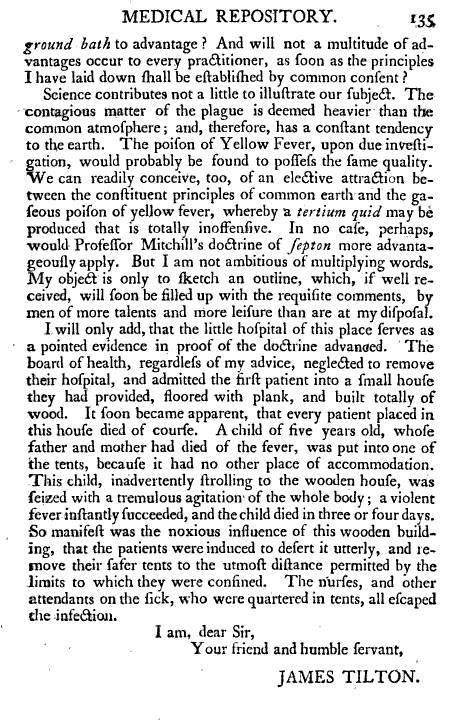 Yellow Fever was considered just another example of Malignant Fever during the years prior, which in turn was a more severe form of the bilious fever people had come to know. The bilious fever in turn was a fever different from the older named fevers like the ague, intermittent, remittent and continuous fever, different types of fevers defined mostly by their cyclicity of fevers, and in the case of ague, chills. 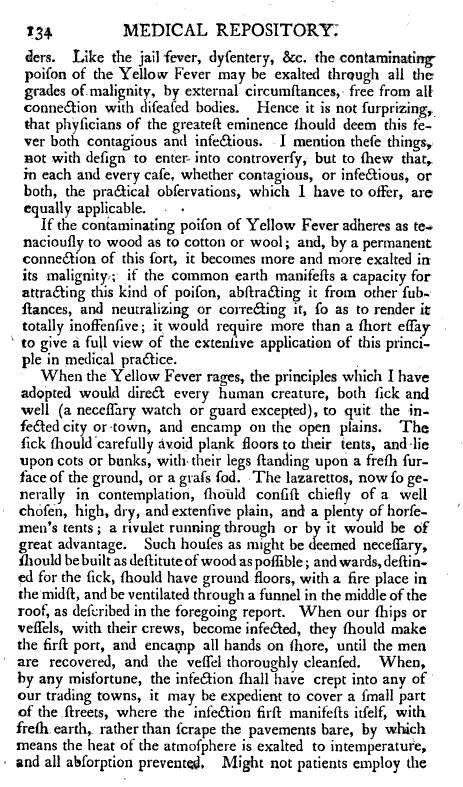 Yellow fever was found to have some limitations in its natural history, very defineable using traditional geographical concepts like continents, longitudes, latitudes, global climatic patterns and the different ways in which one part of the world can be linked to other parts of the world. The earliest geographical concepts to become standard terms for a physician about this time were the names of the zones, starting with the ancient reference to a “torrid zone” on the earth, to which the temperate and frigid zone concepts were later added. The second earliest terms were latitude and longitude. Longitude had as much to do with medical geography as the ocean did to isolating continents and controlling the ways in which diseases could be spread. Latitude had much more to do with disease than just the related line drawn on a map. Associated with latitude were climate, wind patterns, variations and cyclicity of weather patterns, and aspect and angle by which solar rays strike the earth. Latitude had everything to do with diseases that were pretty much isolated by their longitudes and intercontinental water bodies. Transportation and time were the limits to how and where many of the foreign born diseases could be spread. Latitude restricted a lot of the possible migration that could have happened from north to south or vice versa. Longitude, oceans, topography and prevailing winds all worked together to limit the migration of diseases between continents and even between opposing ends of the same piece of land. The simplest geographical rules appled to medicine as physicians used their knowledge of the earth’s surface to better understand diseases. With the needs for special navigation tools and knowledge of more of the details of the earth’s surface, geographers and medical geographers needed to only begin to dissect the earth’s surface down into its various parts–the strata or rocks and soil, the form of the earth’s surface or topography, the behaviors and make up of the earth’s waters, the fauna and flora that played important roles on the local ecology and viability of every region of the earth, and man’s influence upon and susceptibility to these natural features of the earth. By the 1790s, science had developed enough to enable scholars and physicians to begin dissecting their observations down into their minerals and gems, their chemical content, their previously unknown and hidden animals, and numerous other forms of natural minutia. James Tilton’s writing was produced during the first year of medical geography as a formal study of medicine. Tilton never uses this term, but this article was written and published about the same time that Mitchell developed his own medical geography concepts and article on the same topic as Tilton. James Tilton would later be an important leader in the medical profession in the United States, serving as the Surgeon when the War of 1812 commenced. For this reason, many people in the mid-Atlantic region where Tilton resided and worked as a physician treated him like their own “Benjamin Rush” in medicine. 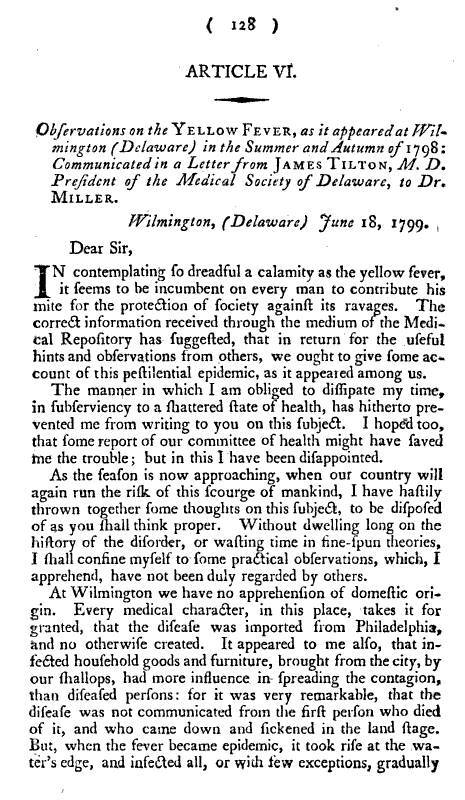 Like another leader in medicine in the mid-Atlantic region, Charles Caldwell (reviewed elsewhere), Tilton’s opinions about the cause for disease, and in particular the yellow fever, differed from what Rush was promoting. 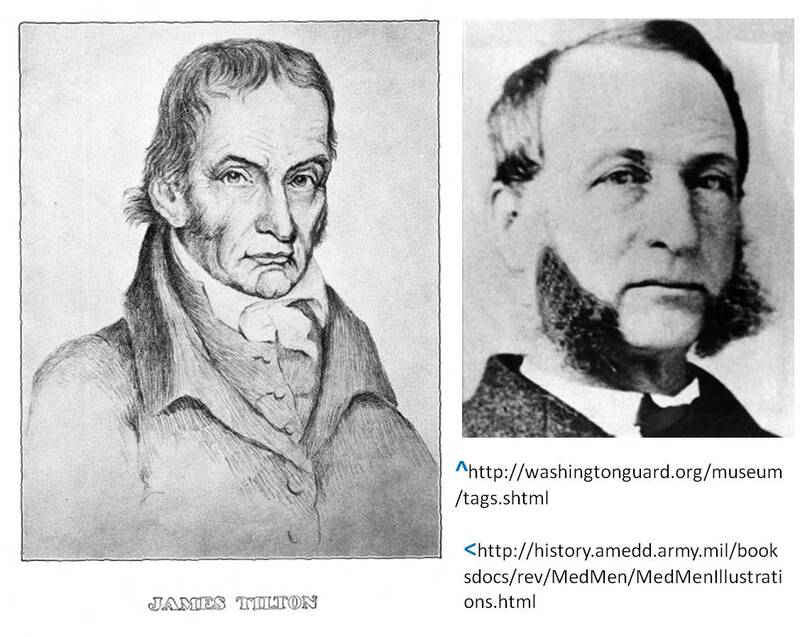 Along with other Rush-opponents like Smauel Mitchell and Valentine Seaman, James Tilton was one of the most important medical geographers in United States history during the first years that this medical specialty became defined. The following article(s) by Tilton provide us with very important insights into his philosophy as a medical geographer. Tilton’s review of disease is globally, regionally and locally. The latter means for interpreting disease patterns was popular throughout much of the history of medicine. 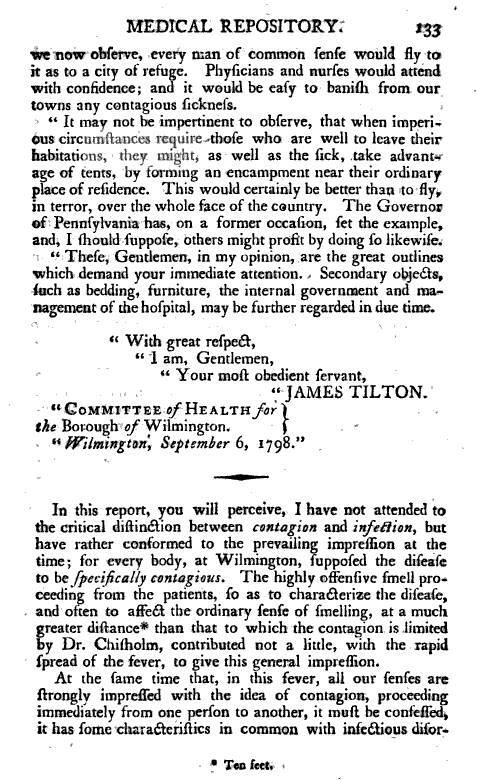 But with the increasing knowledge of environmental causes for disease, and the role of place and proximity in the ways in which disease is generated, Tilton’s writings adds that personal, domestic perspective to disease studies often missing from the much broader topographic and climatic interpretations of disease patterns.